Vermont Log Cabins in the Woods and S’mores! Its summer time and what better way to spend your summer vacation but in one of your very own Vermont log cabins in the woods. While on vacation at the Ridge enjoy sitting around a campfire while telling stories, looking at the stars and making s’mores! Where did the idea of s’mores come from? The Girl Scouts of America gets credit for first publishing the recipe in 1927. The name came from campers yelling “Give me some more!” These little nuggets of goodness are made by using graham crackers, chocolate and marshmallows. One of the most talked about topics near any campfire is s’more technique. The classic approach is to slowly toast the marshmallow until it is golden brown and melted throughout, but some people prefer to poke it into hot flames until it bursts on fire, then is quickly blown out. 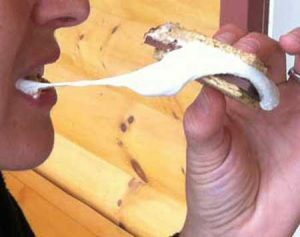 S’mores have become so popular for a campfire treat, there is even a Facebook page for the royal gooeynesshttps://www.facebook.com/pages/Smore/108238539196797. So when you plan your vacation at Sterling Ridge Log Cabins, remember to bring the graham crackers, chocolate (or peanut butter cups), marshmallows and your youthful spirit! Campfire wood is for sale in the Ridge Store along with our S’mores basket or you can have a basket in your cabin upon check-in, just let us know in advance!